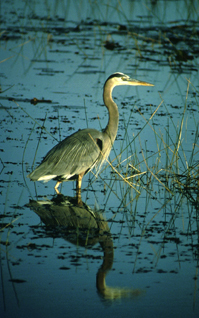 The nation's millions of acres of wetlands are valuable natural resources. Ponds, lakes, swamps, bogs, bays and marine estuaries not only shelter countless fish, birds and animals but also filter pollutants from water and soak up floodwaters. Since the United States was settled, more than half of its wetlands have been lost, and crucial areas like Louisiana's coast and the Florida Everglades are eroding daily. Although the U.S. is now gaining more wetlands every year than it is losing, scientists say too many acres of crucially needed wetlands are still being lost. For several decades national policy has called for protecting wetlands, but the powerful construction, energy and agriculture industries say current environmental regulations make projects too expensive. Conservationists, sportsmen and many state officials argue that stronger regulations are still urgently needed. Meanwhile, recent Supreme Court decisions have intensified debate over how broadly the federal government can oversee activities affecting wetlands.